Although the Tribeca Film Festival does not have a formal market, the sheer number of World and International Premieres has upped the acquisitions quotient for films participating in the program. In the past week, a number of deals were announced that have given the Festival more “industry cred”. IFC Entertainment has acquired North American rights to Luis Piedrahita and Rodrigo Sopena's Fermat’s Room. 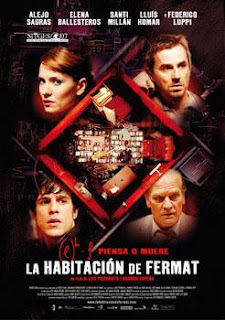 The Spanish drama tells the story of four mathematicians who do not know each other, but are invited by a mysterious host on the pretext of resolving a great enigma. The room in which they find themselves turns out to be a shrinking room that will crush them if they do not discover in time what connects them all and why someone might wish to murder them. The mystery thriller had its world premiere at the Sitges Film Festival, while winning top prizes at Fantosporto in Portugal and the Malaga International Week of Fantastic Cinema in Spain. Spanish international sales company Filmax has acquired international sales rights and Spanish theatrical rights to Paraiso Travel, which had its North American premiere at the Festival this past week. The film, a US/Colombia co-production directed by Simon Brand, is based on Jorge Franco’s novel and has been a major hit in its native Colombia. In the film, a lovesick teenager follows his seductive girlfriend as they illegally travel from Medellin to New York. When they become separated, he searches through the dark canyons of New York City to find his true love. Hollywood talent agency CAA is handling North American rights on the film and a deal could soon be announced. Filmax will aggressively market the film to the European theatrical and television markets. Britain’s Channel 4 has announced a UK television deal for Waiting For Hockney, an American documentary about the artist Billy Pappas, that had its world premiere in the Discovery section of the Festival. In the film, a young working class Baltimore man spends 10 years on a single portrait, believing it is his means to fame and fortune. But he also believes that only one man can lead him there is the famous English artist David Hockney. Uber sales company Fortissimo Films (with offices in Amsterdam and Hong Kong) has bought all rights outside of North America for the documentary film Chevolution, which is also world premiering at the Festival. The documentary, directed by the American team of Trisha Ziff and Luis Lopez, was financed by Red Envelope Entertainment, the distribution arm of Netflix. The film examines how the famous photograph of Che Guevara became an iconic image of revolt and political engagement. The film includes interviews with actors Gael Garcia Bernal and Antonio Banderas, as well as political and cultural figures from Cuba, South America, the US and Europe. The film will be screening in the Cannes Film Market later this month. Expect more deals to be announced as the Tribeca Film Festival closes this coming weekend.